Deb's Cup of Tea: Not your typical museum food. I don't remember food at the museum being this good. I remember the museum had a Pizza Hut outlet when we were members. Finnigan's Ice Cream Parlor is still there. I remember long tables and a series of cases with packaged food. Nothing was fresh and the walls were lined with vending machines to supplement whatever you pulled from the case. Not anymore. The vending machines have been scaled back and there was a bakery/cafe near the food court. We opted to go to the food court because there were a lot of choices. To the left is Carole's lunch. 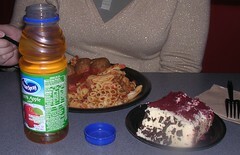 She got mostaccioli with meat balls in marinara sauce, red devil's food cake and apple juice. David got macaroni and cheese, rice, a chicken kebob with a dinner roll, German chocolate cake, an M&M cookie and apple juice. Niles got a vegetarian salad which he said was pseudo-Korean, fries and a dirt cup. If you have kids, you remember this. 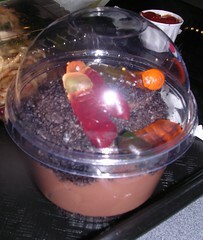 It's crushed Oreo cookies, chocolate pudding and gummi worms on the top. There was so much to choose from; a deli, a grill, a pasta and pizza bar, a 'homestyle' grill as well as prepackaged food. I was torn between pasta and a deli sandwich until I saw the make your own salad. It's a selection of mixed greens, chicken, dried cranberries and crispy noodles with a Thai peanut dressing. For dessert, I had double chocolate cake, of course and hot tea. Yeah, it's pricier than pulling something out of a freezer case, but everything was fresh and it didn't taste like it had been sitting around for 3 weeks. The other nice thing about the food court is that school groups, and there were many today, were not eating in that space. You could take your time to browse and make a decision without worrying that some 3rd grader was going to bump your tray and send your meal flying. We had a great meal without feeling rushed. That makes all the walking worth it.